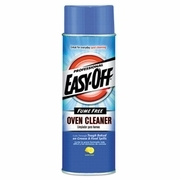 Penetrates tough oven grease without fumes or caustic lye. Advanced cold-oven technology penetrates tough oven grease and effectively cleans without lye or harsh fumes, so there's no need for protective gloves. Nonirritating: safely clean without worrying about skin or respiratory issues. Contains no harsh chemicals: safe for use on stainless steel, enamel, porcelain and glass. Leaves a pleasant, clean scent. 24-oz. aerosol can. *Cannot mix with other products for quantity price break, must be in full carton quantities (6) for price discount.